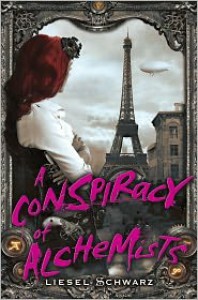 Part fantasy, part history, 100% steampunk, A Conspiracy of Alchemists is Liesel Schwarz's debut novel and the first in an interesting new steampunk series. A provocative look inside an urban fantasy world where magic and Faerie are alive, and Alchemists fight with Warlocks for power and control. There are many other creatures that live within the Shadow realm, and a force greater than themselves that keeps the Shadow and the Light in balance. Taking place during late 1903 Britain, the story was rich with vivid descriptions and examples of many of the important inventions of that time--the steam engine and various flying crafts for example--all of which lent a vibrant feel to the landscape and gave the reader a very strong sense of place and time. The only trouble for me came with the characters, none of which really endeared themselves to me, at least not until much later in the story. I found Elle to be a bit overly combative, to the point where it was actually kind of irritating. Yes, I'm all for a girl who wants to buck the system and doesn't conform to a society's ideals in which she doesn't believe, but I felt she took this a bit too far, to the point where she was almost angry and mistrustful of everyone she met. I don't know, perhaps it was just a sign of the times she lived in, and the opposition she faced being one of the only woman pilots in the world. Marsh's character grew on me after a while; he was likeable enough in the beginning but it wasn't until the end that I actually started to like him enough to root for his well-being. ;) But I think my favorite character had to be the Baroness Loisa Belododia, a Nightwalker and fairly minor character in the overall scheme of the story. I hope to see more of her in future books. Overall, I found this was a strong start to what's sure to be an curious new series. Congratulations Ms Schwarz! You've done a commendable job here, and I believe you've definitely accomplished what you set out to: "write a steampunk novel that resonated with female readers". I look forward to reading the second book in the series when it's released.